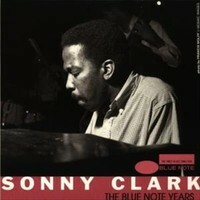 Sonny Clark (1931 - 1963) was an American hard bop jazz pianist. He lived a short, but is nevertheless hear, as a leader on many boards but mostly as a sideman of hard bop musicians like Kenny Burrell, Donald Byrd, Paul Chambers, John Coltrane, Dexter Gordon, Art Farmer, Curtis Fuller, Grant Green, Philly Joe Jones, Clifford Jordan, Jackie McLean, Hank Mobley, Art Taylor, enWilbur Ware. Clark was born and grew up in a mining town. When he was twelve, he moved to Pittsburgh in 1951 to San Francisco, where he played the tenor saxophonist Wardell Gray. In 1953 he recorded with Teddy Charles Gray and his first album. That year he played with a lot of Westcoast musicians such as Art Pepper. In the period 1953-1956 he worked with clarinetist Buddy DeFranco, which he also acted in 1954 in Europe. With DeFranco He also made recordings, appeared on Verve. In 1956 he played with the Lighthouse All Stars Howard Rumsey. He also played in that time with Serge Chaloff and Sonny Criss, and in 1957 he accompanied singer Dinah Washington. In New York, he became one of the most recognized jazz musicians, as a leader and facilitator. As a band leader he recorded include "Sonny Clark Trio" (1957), "Cool Struttin '(1957) and" Sonny's Crib "(his last recordings with John Coltrane, 1959) , albums that are considered. As his best records He played as a sideman on plates of hard bop musicians who recorded for (mostly) Blue Note, including Kenny Burrell, Donald Byrd, Grant Green, Jackie McLean, Art Farmer, Hank Mobley, Art Taylor, Dexter Gordon ("Go") and Clifford Jordan. He also participated in recording sessions, for example, Charles Mingus, Sonny Rollins, Billie Holiday and Lee Morgan. Clark was addicted to heroin and died of an overdose. After his death, his work was by jazz fans (especially in Japan) are more appreciated than during his lifetime.